3 How to Get Rs.5000 From UC browser Pc? Hello guys, Now we are back with Another offer from Uc team. We have Posted Ucweb Rs.5000 Directly in Bank Account Trick, refer and earn Rs.8000 tricks and Many Of Us Already Got Money In Bank and Paytm, Uc browser pc Has same Refer & Earn program now. You Will Get Instantly Rs.2500 On Sign Up using referral code. Then invite friends to reach the bar to the target of Rs.5000. The only problem that this offer can only loot for those who have pc or laptop. Users can use friends or relatives desktop. This offer is active now and ends on 6th September 2017. You should reach the target to redeem your rewards. So don’t waste your time, loot fast! Here is How to Get Rs.5000 Real Cash. Just follow the steps below to get started. 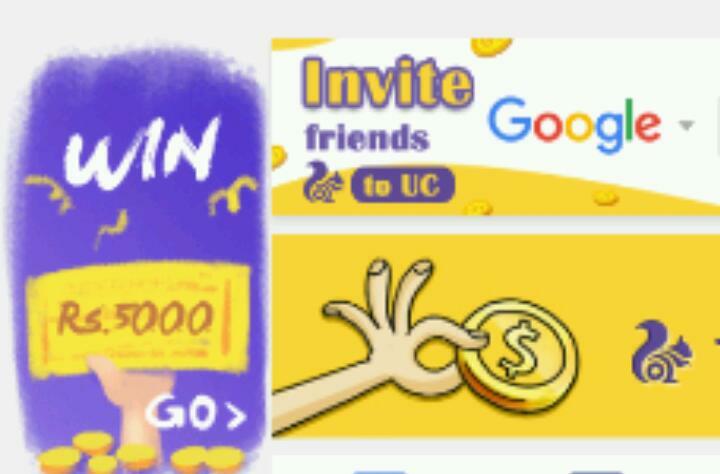 How to Get Rs.5000 From UC browser Pc? ◾ Participants can only claim the prize after Rs.5000 been collect. ◾ To collect remaining money you need to invite your friends to UC browser pc and ask the to use your code. ◾ Every user can only help 1 friend. ◾ When you have collected the entire amount of Rs 5000. Click on the ‘Prize’ button and fill in your contact information in order to get the money. ◾ UC browser pc will deliver all the prizes before December 7, 2017. ◾ All the pictures shown of the prizes are only for reference purposes. ◾ Kindly do not un-install UC browser pc during the campaign. They sre not responsible for the loss of your information/prizes lost due to un-installation.